I'm no real hobbyist, nor victim of arrested development (that's a thing beyond a TV show, ya know), but every so often I have looked in on model railroading (loved it as a kid), and recently saw that there's now a Rheneas model train available to accompany a previous Percy one. Someone kinda did, actually. Yes, that's Percy in there as well. Rheneas clearly has a drug problem. I wanted to recreate the "Run to the Sun" video, but getting a near-naked Jason Statham again wasn't so easy. You set your sights too high with the videos. I'd stick to sleeve art. Two dolphins in the bathtub. Old couple in the spare room. Ginger boy in the closet. I'm working on a Circus Tiger next, but he'll have to share with the boy or the couple. This is Manhattan. It has the German vocal version - sung by Susanne Störrle, NOT Andy B) - and is exclusive to the German edition. It's more than just a karaoke though, as the music has also been remixed to some degree. The track is there instead of the extended version of March On Down The Line found on the UK and other editions - which was a repeat from the standard 12" anyway, so it's arguably 'better' than the UK and other editions. Plus, unlike the UK edition which came in one of those 'slim' 12" sleeves (with a cut-hole even I think), it's in a 'better' album-style outer sleeve with inner sleeve! 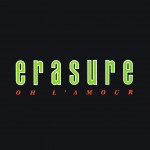 Yeah... Oh L'amour is a complicated release for sure! Yes, that sounds like the REISSUE of the standard UK release. 1. 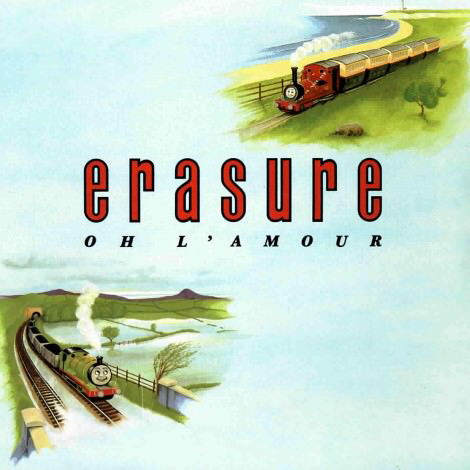 The ORIGINAL UK edition of both the standard 7" & 12" of Oh L'Amour came in what is known as the "Thomas The Tank Engine" sleeve - pale blue with children's storybook trains in the corners, in keeping with the style of all Wonderland releases. 2. 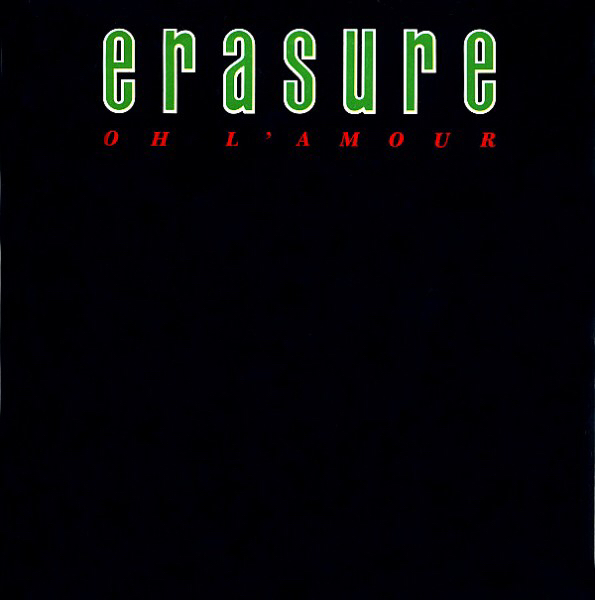 This was quickly withdrawn due to copyright issues with the artwork, and so BOTH the 7" and 12" were REISSUED in BLACK sleeves, with the ERASURE logo in GREEN. Confusingly, SOME of these have a hole in the sleeve, and some don't. There is however a picture of a train on the record label, which is as you described. 3. To add to the confusion, the UK limited edition 12" was, by default, ALSO in a black sleeve, but the logo text on this is RED. 4. 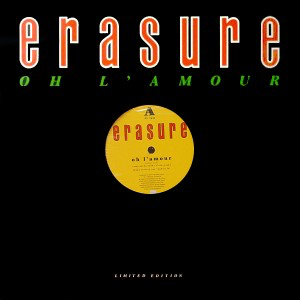 Generally, the German releases mimicked the UK editions, with a 7", 12" and a L12", and used the same artwork (but in sturdier sleeves, and often coloured/marbled vinyl editions). 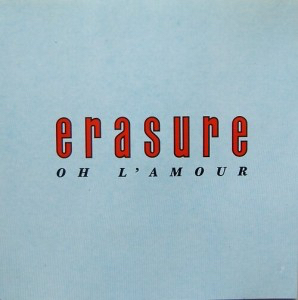 Except with the 12" of Oh L'amour, which went with a pale blue sleeve minus 'Thomas'. As far as I am aware, there are no German editions with a hole in the middle of the sleeve. Hope some of that helps and doesn't just make it even more confusing!